Are you a coach who is ready to take your coaching to the next level by working with a professionally trained Mentor Coach? Is it time to start accumulating your Mentor Coaching hours in preparation for learning your next ICF credential? 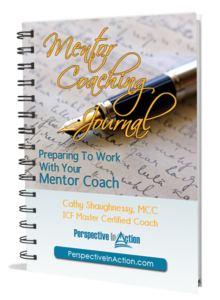 Mentor Coaching is one of the services I offer as a Master Certified Coach and I highly recommend using a Journal for your Mentoring. A journal like this helps keep you on track with the goals you have set for yourself and will kick-start your work with a Mentor Coach. You’ll also receive insider coaching tips, techniques, and strategies for being the best coach you can be! Delivered right to your inbox. Learn more about my Mentor Coaching services.